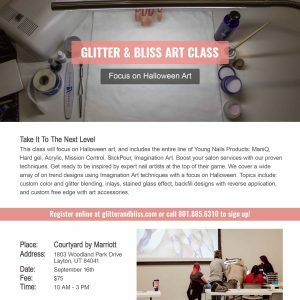 Glitter and Bliss is an authorized Young Nails Distributor. We pride ourselves in offering the best continuing education around. Our facility is amazing, and each station provides all the product you need no matter the class. Whether you just graduated, or are a seasoned pro, sign up for one of our affordable classes to improve your skills, accelerate your speed, and ultimately make more money. Class sizes are small to give you the attention you need, and get your questions answered, so they fill up fast. Check back often to keep updated on our schedule, and sign up for our newsletter to make sure you never miss an update.